Japan Railways Dual Mode Vehicle | OhGizmo! When it comes to commuting buses are definitely more versatile than trains but at the same time they’re also a lot slower. 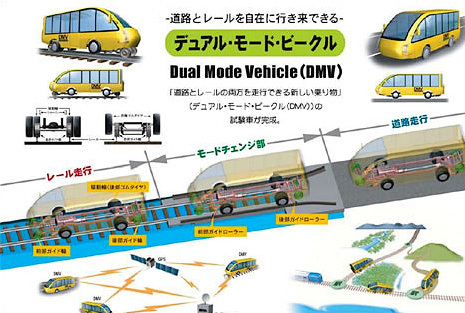 To get the best of both worlds the Hokkaido Railway Company (a division of Japan Railways I assume) started to develop a prototype vehicle way back in the year 2000 called the DMV or Dual Mode Vehicle. About the size of a small bus the DMV can carry 25 passengers but what makes it special is its ability to travel on either roads or rails since it has a set of both steel and rubber wheels. The idea is that the DMV can use existing rail infrastructures available in more developed areas and then switch to road travel for areas that are less densely populated. The first DMV service is scheduled to begin by April of 2007. Although the ultimate goal of the DMV is transport in rural areas, the first application will be on a tourist route traveling round trip from Hamako-Shimizu to Mokoto along the Senmo Main Line on the northeast coast near Abashiri. During this trial period the DMV will go one way on track (11 km) and then return by meandering roads as a bus (21 km). The success of the DMV will be of great benefit to both JR Hokkaido and the declining rural population of the island. At present one third of JR Hokkaido?s routes are unprofitable, carrying less than 500 passengers a day. DMV service may save many thousands of residents from losing their rail transit while providing them with even more convenient ?door to door? service. Japan is defintiely a world leader when it comes to efficient public transportation so hopefully this experiment will work out and eventually spread to other growing metropolitan centers around the world.